How’s a queen to keep her head in the middle of a revolution? Marie Antoinette delights and inspires her French subjects with her three-foot tall wigs and extravagant haute couture. But times change and even the most fashionable queens go out of style. 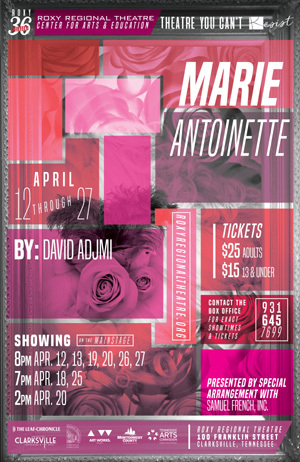 From the light and breezy banter at the palace to the surging chants of “Liberte, Egalite, Fraternite!” in the streets, David Adjmi’s humorous and haunting contemporary take on the doomed young queen of France holds a mirror up to our contemporary society that might just be entertaining itself to death.